Here is another stop motion animation, this time created by drawing pictures in sand on glass. Caroline Leaf based “Owl and Goose” on an ancient Inuit story about an Owl’s unrequited love for a goose. 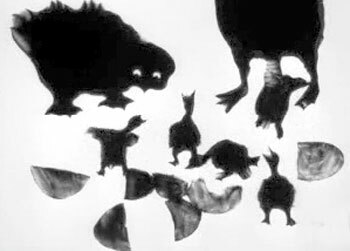 As told in this interview she worked with Agnes Nanogak, an Inuit artist who created the animal silhouettes necessary for sand animation. During her stay at Holman Island, she met some old Inuit women who still remembered hunting with their fathers. They used to mimic animal sounds to attract prey – and these became the sound track of the story. Six old women sat around a microphone and made the sounds and laughed a lot. I got what I wanted, but it was puzzling, uncomfortable work. 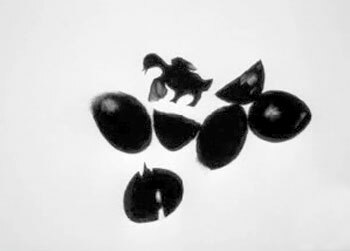 For example, after I screened the film, which is nine minutes long and involves the eggs of the owl and the goose hatching, one old lady got up and walked out, saying that what the film showed was not true, eggs take two weeks to hatch. That’s quite interesting. The verbal story of the hatching eggs did not last longer than the animated version does. Is it the illusion of life that makes the distorted time in the animation so upsetting? I was never sure that I wasn’t using the Inuit people. I knew that their stories were truth and history for them, and they didn’t tamper with the storytelling or make personal changes. That is why the stories were remarkably the same across thousands of miles of the Arctic. And I had had to change the story, to personalize the animals, to make it mine in order to be able to tell it. 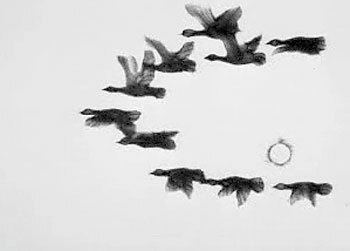 Improvisation in sand – a sand animation by Cesar Diaz, and a small interview with him. This is probably one of my all-time favourite animations, it’s so beautiful. I saw it in the National Gallery in Ottawa and I kept going back to watch it again! I would love to have the chance to see it at a bigger size – I’ve only seen the on-line version.